Convert Sony, Canon and Panasonic AVCHD/MTS/M2TS footage to HD MKV, HD AVI, MP4, WMV, MOV or other SD/HD video formats with lossless video quality. 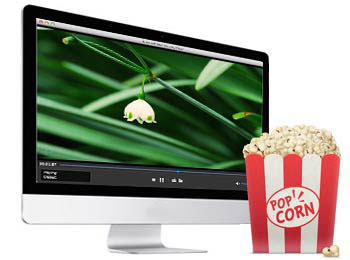 Convert MTS for FCP, iMovie, FCE, Avid, Premiere Pro, Vegas Pro, Pinnacle, CyberLink, etc. 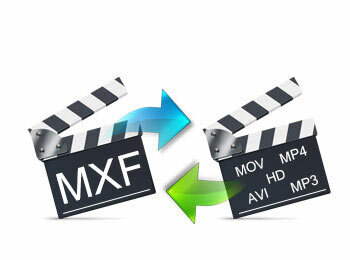 Convert AVCHD/MTS files to videos compatible with IOS/Android/Windows tablets, HDTV, etc. 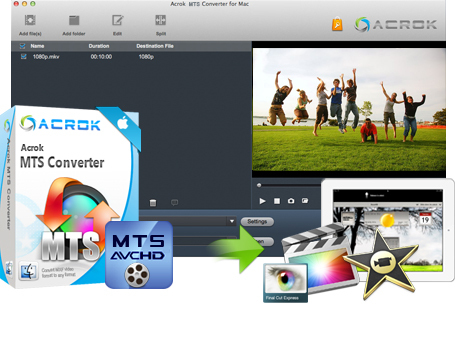 Acrok MTS converter is a software mainly help AVCHD/HD digital camera users to easy convert AVCHD/MTS/M2TS files on their PC and Mac, with it, users can transcode .MTS files to any other video format you want, such as convert MTS to MP4, MOV, M4V, AVI, MKV, Divx, Xvid, FLV, etc. besides, it also has friendly profiles options to help users easy choose what kind of digital devices to use as, such as convert MTS to iPad Air, iPhone 6, PS4, Xbox One, Galaxy Note 5, Galaxy S6, Surface Pro and other hundreds of digital devices. What if we want to do some editings on AVCHD/MTS/M2TS? As known to all, MTS has its weakness as it is hard to edit and many software can’t support MTS files importing. So we also provide the mts editor functions together with conversion in one program. Now lets see what smart video editing features it is designed with. Comparing some complex movie editors such as Final Cut Pro, Adobe Premier Pro, Sony Vegas Pro, Adobe After Effects, iMovie, Avid Media Composer, Premiere Elements and etc., mts editor moduel is easy to use even if you do not have any clue about clipping, trimming, cutting, merging, watermarking, removing unwanted parts or blacks bars, 3D visualization, audio effects, various video effects, etc. There are two versions avaliable for Windows OS and Mac OS. As for supported HD camcorders, we tested Panasonic camcorders, Sony camcorders, Canon camcorders, JVC camcorders and which use MTS files as footage. So if you have any of the mts recordings, you are sure to have an .mts converter at hand. 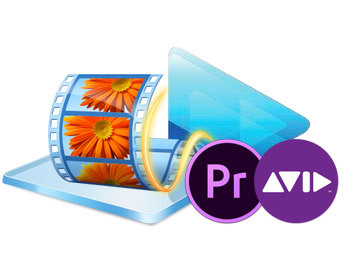 It is the best way to resolve the problem of importing MTS files recorded by your camcorder in Final Cut Pro, Premiere Pro and other professional video editing software. It supports optimal profiles for certain editing software, like Apple ProRes, DVCPRO, HDV, Avid DNxHD, XDCAM, H.264, MPEG-2, and Apple InterMediate Codec (AIC). With this best MTS Converter, you can edit your video recordings into Final Cut Pro, iMovie, Final Cut Express, Adobe Premiere Pro, and Avid Media Composer for professional editing. For MTS camcorders or cameras users, this MTS Converter brings peerless using experience. High quality conversion with zero quality loss, unmatchable converting speed, humanized feature design, user-friendly interface and simple operation, all these are reasons why Acrok MTS Converter worth a try. Sony HDR-PJ340/B, HDR-CX240/L, HDR-PJ275/B, HDR-PJ810/B, HDR-CX330/B, HDR-CX900/B, HDR-AX2000, HDR-UX1, HDR-UX3/UX5, HDR-UX7, HDR-SR1, HDR-SR5, HDR-SR7, HDR-SR5C, HDR-SR8, HDR-CX7, HDR-SR10, HDR-SR11, HDR-SR12, HDR-TG1/TG3/TG7, HDR-CX12, HDR-CX100, HDR-XR520V, HDR-XR500V, HDR-XR200V, HDR-XR200VE, HDR-XR100, HDR-CX500E, HDR-CX520E, HDR-CX105, HXR-NX5, HDR-AX2000, HDR-XR550, Sony NEX-5, NEX-5C, Sony HXR-MC50E, Sony NEX-FS100, NEX-VG20, Sony SLT-A65, Sony SLT-A77V, Sony NEX-5N, Sony NEX-7, Sony DSC-HX5V, HX5V-E, Sony DSC-HX9V, HX9V-E, Sony HX10V, Sony HX20V, Sony DSC-RX100, Sony DSC-RX100 II, etc. HF11, HG20, HG21, HF S10 , HF S100, HF20, HF200, HF S11, HF S21, HF S20, HF S200, HF M31, HF M30, HF M300, HF R11, HF R10, HF R100, HF G10, HF M500, etc. Panasonic HC-MDH2GK-K, HC-X920MGK, HDC-DX1, HDC-SD1, HDC-SD3, AG-HSC1U, HDC-SD5, HDC-SX5, HDC-SD7, HDC-SD9, HDC-HS9, AG-HMC70, HDC-SD100, HDC-HS100, AG-HMC150, HDC-HS300, HDC-HS200, HDC-TM300, HDC-SD300, HDC-SD200, HDC-TM30/HDC-TM10, HDC-SD10, HDC-TM350, AG-HMC40, HDC-TM700/HDC-SD700/HDC-HS700, HDC-SD60/HDC-TM60/HDC-HS60, AG-AF100/AG-AF101/AG-AF102, AG-AC130/AG-AC160, DMC-ZS3/TZ7, DMC-TS1/DMC-FT1, DMC-GH1, Lumix DMC-ZS7/TZ10, DMC-G2, Lumix DMC-GH2, DMC-GF2, Lumix DMC-ZS10/TZ20, Lumix DMC-FX77/FX78, DMC-TS3, DMC-FZ45/47/48, Lumix DMC-GF2, DMC-G3/GF3, Lumix DMC-TZ30, Lumix DMC-G5, Lumix DMC-FZ200, Lumix DMC-GH3, Panasonic Lumix DMC-LX7, Lumix DMC-GX8, Lumix DMC-G7, etc. JVC JVC GY-HM650EC/JVC GY-HM600EC, JVC GZ-G5, JVC GC-XA2, GZ-HD10, GZ-HD30/GZ-HD40, GZ-HD320, GZ-HD300, GZ-HM200, GZ-X900, GZ-HM300, GZ-HM400, GZ-HD620, GZ-HM1, GZ-HM30, GZ-HM4XX, GZ-HM6XX, GZ-HM8XX, GZ-HM9XX, etc. The MTS file format supports 1080i (a high definition video format with 1080 horizontal scan lines, interlaced) and 720p (720 horizontal scan lines, progressive scan, rather than interlaced) in a relatively small file size. AVCHD video files can be burned to Blu-ray discs and played in compatible devices. MTS is a file extension for an AVCHD (Advanced Video Coding High Definition) video clip format for high-definition video. The MTS file format supports 1080i (a high definition video format with 1080 horizontal scan lines, interlaced) and 720p (720 horizontal scan lines, progressive scan, rather than interlaced) in a relatively small file size. AVCHD video files can be burned to Blu-ray discs and played in compatible devices. Sony and some Panasonic video cameras have software to open and edit MTS files. Other players convert the files. AVCHD files are based on the MPEG 4 codec.